Along with the new laptop and camera - we are now a household that owns an Ipod. I am a bit technologically challenged at the best of times, I just like things to stay the same and never change. We managed to set the Ipod so that it receives our emails... which is not such a good thing since hubby is the proud owner of the new baby, and I'm the one who receives all the interesting emails like blog comments and fabric sales. So late last night... after the laptop was shutdown , he received some emails, and came to check with me whether I'd read them already or not (I think I was brushing my teeth after getting out of the shower - so had a towel wrapped around me and a mouth full of toothpaste - like the most convenient time to ask something). Some of them I had already received, and some I hadn't, so assuming that I would also receive those new ones - I told him to delete his ones. To cut an even longer story short - well, those new ones he deleted have never been received by me, and quite where they've gone I've got no idea. Of course, some of those emails were blog comments. Leeanne: I downloaded Picasa 3 which is a free photo editing thing - does all the basics, cropping, rotating etc, as well as some extra functions which I intend to have a play with at some stage in the future. You can then choose to share - which flicks those selected photos up into Picasa web albums (which is where the blog photos seem to end up anyway) - it allows you to choose the size, so I don't have problems with high resolution photos which take forever to download. I'll have to try doing it again to see whether it was just a fluke that it seemed easy... or whether it actually is. Suz: I got the solids from "Thousands of Bolts" who have an online store, who had FQ on sale on day, and were very nice to send me an email about it. I'm not really a solids person, but clicked on the link, and this selection was the first thing to fill the screen - I just loved the mix of greens and blues, with some cream and mustard thrown in - so just added them all to my cart. The colours weren't 100% - but fitted within the range. I'd be cautious if I needed colours to match perfectly. Monika: any advice about the Ipod welcomed! I've managed to set up a new email account, so we just need to try editing the address (I hope) - then I can get my ones... and he can get his ones. Will there or won't there? Much of my afternoon has been spent firstly trying to connect the printer to the wireless network. The rest has been getting the camera to download to the laptop... and then working out the best way to edit the photos since my photo editing software that I finally worked out how to use has disappeared. I simply don't have the strength to work out how to format my photos properly on this post... so it will just have to be a bit messy - but at least there are photos. 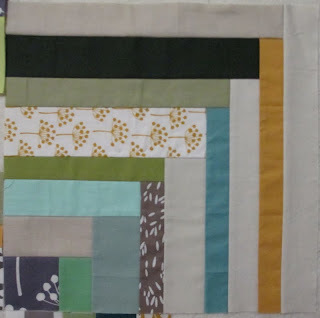 My design wall - half log cabin blocks which I started sewing at retreat using my pile of Moda bella solids in bluey greenie colours with a hit of mustard, and some Jotta Lansdotter prints. The gaps will eventually be filled with assorted cream filler strips. I'm having fun mixing the different colours and prints without being too worried about what goes where. Very meditative. Ahh, the circles. This quilt is from Modern Mix... I'll give more details in another post, but this is the start of the quilt on the cover. The book focuses on mixing plains with solids... has some really neat ideas. This was just really a bit of an experiment with the closeup function on the camera. The zigzag setting I used is 1.5w by 1.0 stitch length. It really is very tiny. And this is the book where this block appears. The insurance has finally come through - so new gadgets all round. Have the email finally up and running (could get it to receive but not send)... Internet under control (I think)... tomorrow I'll work on the camera situation, and maybe tackle the wireless printer. So progress in the technology department. Your reward for persevering may actually be some photos of what's been happening in the sewing department. Keep your fingers crossed! Well, still no word from the insurance company about replacement items... so still no new photos to show. I have just finished my April Swoon Block... mid May! This was not without its challenges - it was just one of those "how on earth did I manage to sew those two bits together and not notice until now" sort of scenarios. After multiple unpickings, and multiple sewing something else wrongs... I finished the last seam this morning. Ahh - the satisfaction of a finished block. I have also been slowly zigzagging around my circle shapes... does anyone remember this one? Well, it got taken along to retreat with me a few weekends ago, and I laid out the circles constructed so far on my solid grey background strip. Although my circles didn't fill the entire space, I quite liked the few open areas... so decided to leave it as it was. I'm probably about 1/3 of the way through the attaching process, and hopefully will have something more to show... once I've got a camera. I also quilted my first quilt on my new handiquilter frame using the lazer bit on a self made pantograph. I used a simple figure eight design, similar to that used in many of Denyse Schmidt's quilts... it gives great texture and doesn't fight with the actual piecing. Anyway, you'll just have to believe me on this one - my binding it attached, and I'm halfway through the handstitching bit. So looks like Nadia will get it on her bed before winter finishes this year. Now, do I start my May Swoon? or play with my log cabins?... got to hang washing out first - for a change it is actually sunny!